The Great Recession turned out to be quite good at keeping troubled unions together. Divorce rates fell every year in America during the economic downturn. According to the Centers for Disease Control and Prevention, which tracks marriage statistics, there were 63,550 fewer divorces in America in 2009 than there were in 2006. Numbers aren't out for 2010, but divorce lawyers and marriage counselors say 2010 was likely the first year since the financial crisis that more couples called it quits than in the year before. And that won't only make things more difficult at holiday times. April 15 (or April 18 this year, because of an extension) can be complicated for the recently divorced as well. 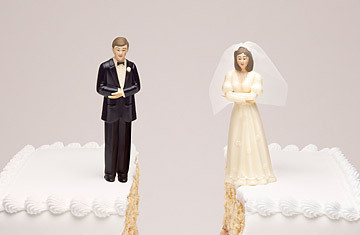 While the rules for divorced taxpayers haven't changed that much in the past few decades, divorce has. Joint custody and other changes in the way people split property has only made figuring out what is owed to Uncle Sam and by whom harder than ever. Even if your divorce was finalized between Jan. 1 and April 18 this year, you are still officially hitched to your ex-spouse when it comes to filing your 2010 taxes. The flip side: if your divorce became official in December, you can't file as married even if you were for most of the year and it would save you money. There is, however, a third status you can claim besides single or married. It's called "head of household," and it could save you money. The status was originally meant for single people, but some people in the middle of a divorce might qualify as well. To do so, you have to have lived apart from your spouse for the last six months of the tax year; paid over half the cost of keeping up your main residence; and be able to claim, under the rules for children of divorced or separated parents, your child as your dependent. Also, you have to file a separate tax return from your spouse, even if you are still legally married. But if you are still willing to fill out your estranged mate's IRS forms, go ahead and check the married box. You don't have to pay income taxes on assets that are transferred during a divorce. But if you end up getting the house, you won't be getting it tax-free. The reason has to do with capital gains taxes, which still apply even to the recently divorced, and they come into play if you decide to get rid of your house after the divorce. Normally, a married couple doesn't have to pay taxes on a gain of up to $500,000 on their primary residence. But now that you are single, you can only exempt half of that. So if your house sells for more than $250,000 more than what you and your former spouse paid for it, you will owe taxes. But you do get one advantage if you are recently divorced: if you moved out of the house before the divorce was final, and then ended up getting the house in the proceedings anyway, you can still claim the house as your primary residence. Generally, you can claim the kids as dependents only if you were designated the custodian by court order. When there is no such agreement or order, or when joint custody applies, the custodial parent is considered to be the parent who has physical custody of the child for most of the year. What happens when you share custody 50-50? Of course, you can't both claim the same kid as a dependent. That's against the law. Some couples switch who claims the kids from year to year in order to share the tax benefit, and if you only have one child that's the only option. But if you have more than one kid, the best bet to avoid confusion may be to split the dependency of the kids up between the two parents, which is allowed even if both kids spend the same amount of time with each parent. In most cases, alimony, if you are the one paying it, will lower your tax bill. Even better, alimony is an above-the-line deduction, which means you don't have to itemize to get the tax advantage. Still, there are no tax breaks for lingerers. If you and your ex-spouse continued to share a residence after the divorce, any alimony payments made during that time cannot be deducted. What's more, the payments have to be pursuant to a written separation or divorce agreement, and cannot be considered child support. So couples who are facing extended divorce proceedings due to finances, custody battles or state laws that require extended periods of separation may still have trouble qualifying for the deduction. While alimony is considered a taxable event, child support is always tax-neutral, meaning it doesn't affect your taxes in any way. This can provide an incentive to the ex-spouse who is making the payments to attempt to classify part of child-support payments as alimony, especially as state laws increasingly complicate the requirements for support. In recent years, for instance, parents have been required to make payments for college education. No matter how big the check  or how long a parent has to write it  the tax-neutral rules still apply. Watch TIME.com's video "Royal Weddings and American Marriage." See the top 10 perpetual divorcés.